The picture you see on the left is UTP Cat5e 4 pairs cable. You can see the basic colors Orange, Blue, Green, and Brown. Each are twisted with white cable strips with the matching color (e.g. white/orange, white/blue, and so on). Sometimes there are cables with no strips, only white color. There are wiring standards that you must follow, the T568A and T568B. If you're installing cables on a new network you should always follow these standards, you can use a standard of your own in the older projects as long as other cables are using that standard also. 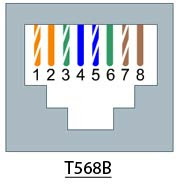 There is a reason why I show this T568B wiring scheme first, I have my own way to remember which cable should go where. After that I like to remember using numbers, I change the 3rd cable with the 5th cable. There you have it, T568B wiring scheme. You can remember the cables the way you like. I switch the 1st cable with the 3rd cable. And then switch the 2nd cable with the 6th cable. This is only the way I like to remember the wiring scheme, you can use whatever method you prefer. Next I want to tell you about the Straight-Through cable and the Crossover cable. 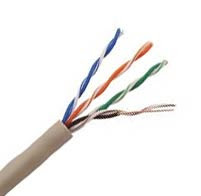 If you want to connect two different networking devices such as router-switch or switch-computer you should use the Straight-Through Cable. One exception is that you should use the Crossover cable to connect router-computer. Why? because router and computer belong to the same level on OSI Layer, I'll talk about OSI layer some other time. Now Straight-Through cable is a cable with the same scheme on both ends. For example, you use the T568B on one end and the same with the other end, then you'll have a straight-through cable. 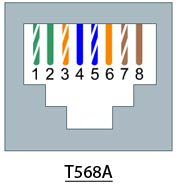 Some people debate that you should use T568A for straight-through cable and some people say to use T568B. If you ask me, it doesn't matter which scheme you used as long you keep it constant in your project. Next the Crossover cable is a cable with different wiring scheme on both ends, one end use T568A and the other end use T568B. The more modern networking devices have the ability called Auto MDI/MDIX, this means they can detect what wiring scheme you use, and you can use whatever wiring scheme to connect two different devices. But just to be save, just follow the standard wiring schemes.